Netflix has still been scoring big as of late despite rumors of not being as profitable to investors and mixed press from mainstream media about their questionable social media challenges. One thing still holds true is that they are still putting out great original content. 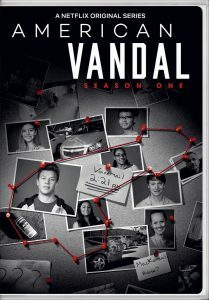 American Vandal was a Netflix original series released in 2017 that received high acclaim. It was even awarded the coveted “Certified Fresh” award by Rotten Tomatoes. Many touted it as culturally iconic. The story is about Peter, an aspiring filmmaker who investigates the hi-jinx of a high school prankster with the help of his friend Sam. Dylan Maxwell, was the main suspect that left 27 high school faculty cars vandalized with “phallic images”. Sam and Peter do a little investigation of their own; collecting data to find out who the culprit really was. A different take of what high school life is like in modern times, American Vandal is an interesting “under the looking glass” metaphor for what in going on in today’s classrooms. and how its like growing up in the social media age. Although the premise seems comedic at first, this refreshing look at a true crime story really ends up stealing your emotions in the end through the bread crumb trail that eventually leads them to their next reveal. A great series to binge watch but not recommended for all ages due to use of graphic images and language. Next articleYou’re A Mean One Cumbergrinch!